Tufloc Universal Mount Gun Rack FREE SHIPPING! Add easy-access and secure overhead weapon storage to vehicles with a Universal Mount Gun Rack from Tufloc. Designed for law enforcement vehicles without prisoner partition screens, the accessory installs quickly and easily to any existing rack system with an expanding mounting bar that fits securely between door frames. 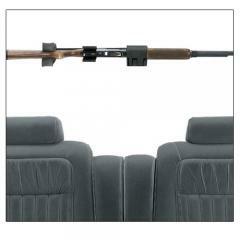 The gun rack's low-profile design has no impact on head room or encumber driver visibility. It offers flexible options, such as variable positioning and storing of all firearms with the muzzle facing the driver or passenger side of the vehicle.The rack is crafted from high-strength steel with a powder-coated finish and includes padding to protect weapons and prevent rattling. Weapons remain secured with Tufloc's dual-release electric lock, which can be accessed by a key or an 8-second delay timer. ©2002-2019 CopsPlus.com: Tufloc Universal Mount Gun Rack FREE SHIPPING!